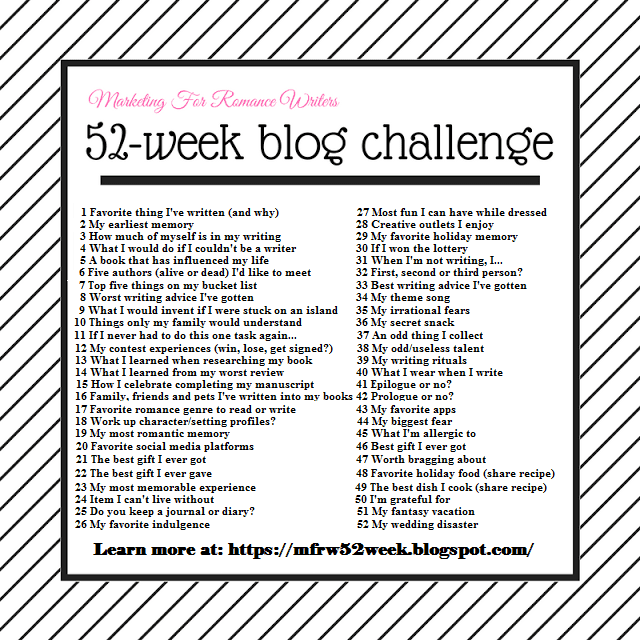 Welcome back to the 52weekMFRWblogchallenge. This weeks topic is Things about me only my family will understand. Once again I almost skipped this. The only thing I can come up with is I have a weird quirk. When I am cooking and cutting stuff up everything needs to be the same size. No, I don’t measure but I am good with my eyeing it. When I cut up potatoes to boil or veggies for stirfries or stew I line them up and make sure they are very close to the same size. My daughter in law and daughter when they help me cook now know this and try to do the same or let me do it and ignore me. When I load the dishwasher all the same size plates go on one side, glasses in a row by size. In my cabinet food goes by type ( no I don’t alphabetize). Do you have quirks only our family understands? Let’s go see what the other authors have to tell us about themselves. I would have to give you grief about this – I would point out the potato cube that was point 2 millimeters larger than the others. Only because my OCDness is similar. The hubs has often commented that if he didn’t know better, he’d think it came from a factory because everything is same sized. Is there any other way to store food in a cupboard or load the dishwasher??? I don’tmy chips or fries, but if I have something like M&Ms, you can bet they’re sorted by color! Lol Sherry I sort m&ms by color too. And I freak out if I miss one. It’s like “ oh no what do I do., I already ate all the red! My granddaughter is happy to help me out. M&Ms are sorted by color. I eat brown first, then orange, yellow, green, blue, and red last. Although just to be daring, sometimes I eat one red then one blue until they’re gone. Lol glad I am not the only one! I too eat red last. Today my granddaughter had fruit loops she too has the color coding down pat lol! I have certain ways of putting stuff in the dishwasher, and the way the bowls, plates, and cups are arranged in the cabinets. Drives me crazy when the kids and spouse put things away ‘wrong’. Glad I’m not the only one!!! I am glad I am not the only one too. I make sure my towels hang straight. Sometimes I categorize my clothes in the closet, like tank tops and sweaters, but I’m okay if I get them out of order. I do count things like patterns on doors. So does one of my sons. Enjoyed your post, Cathy. A little OCD never much hurt anyone! Plus with cooking it’s better to have the chopped items the same size for uniform cooking, yeh?